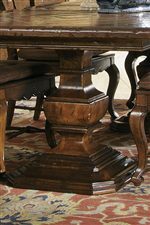 Add a traditional elegance to your dining room with this wonderful dining table. The table top features a hand-planed mahogany and veneer plank style design in a distinctive diamond pattern. The warm Cognac finish and the shapely cabriole legs provide a traditional design. The table comes with two leaves extending it up to 98 inches perfect for hosting dinner parties. Add the matching arm and side chairs to this table for a brilliant dining set. The Rue de Bac Rectangular Dining Table with Cabriole Legs by Hekman at Design Interiors in the Tampa, St. Petersburg, Clearwater, Florida area. Product availability may vary. Contact us for the most current availability on this product. Leaves Two 18" leaves extend table from 62" to 98". 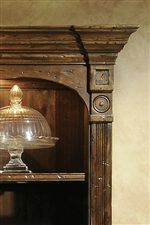 Finish Mahogany solids with veneers in a warm Cognac finish. Customizable Options Plasma console features a wood plank door or seeded glass option. 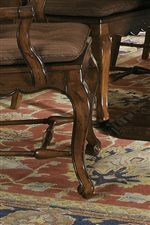 The Rue de Bac brings a traditional elegance to your living room, home office, and dining room. Many of the tops and case fronts feature a hand-planed mahogany and veneer plank style design in diamond, horizontal, and vertical patterns. Some of the tops also boast a marquee style with star shape design. 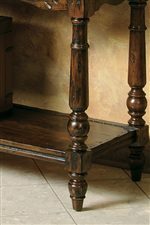 Most stretchers feature decorative carving and cabriole style legs are common throughout. Many of the pieces feature modern functionality with keyboard drawers and wire management cutouts to combine the classic design with modern style. The warm Cognac finish provides a lovely feel to this amazingly versatile collection. 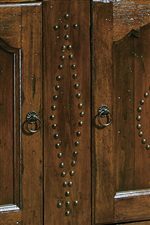 The Rue de Bac collection is a great option if you are looking for Traditional furniture in the Tampa, St. Petersburg, Clearwater, Florida area. Browse other items in the Rue de Bac collection from Design Interiors in the Tampa, St. Petersburg, Clearwater, Florida area.